"A wonderful way to use the extra bounty of summer, and make a tasty treat. You can adjust the recipe to suit your family's tastes, or create your own variations. For an optional topping use any, all or a combination of the following: equal parts brown sugar, chopped nuts and mini chocolate chips. Sprinkle tops of muffins just prior to baking." These were great! I used a cup of apple sauce instead of the oil and cut the sugar in half to make them a little healthier. I changed it a bit, since I didn't have cardamom on hand~ doubled the cinnamon instead. I also did half brown/half white sugar and it still turned out great. 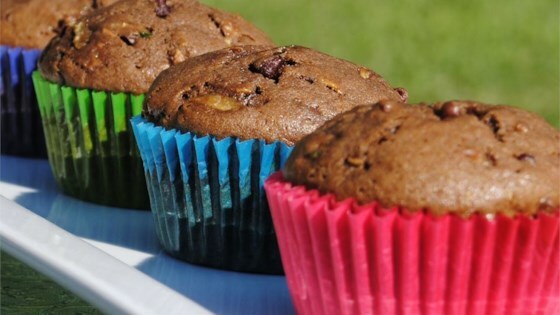 My children loved these muffins. I did make one change. There was too much oil for my taste, so I used 1/2 cup oil plus 2 mashed ripe bananas. Very moist and nicely spiced muffins. These were a big thumbs up. Yummy! I didn't have enough cocoa so I added a few chocolate chips to the batter and sprinkled a few on top before baking.